Like Free, AC/DC, Lynyrd Skynyrd and a multitude of others, The Allman Brothers Band suffered the loss of at least one vital member. 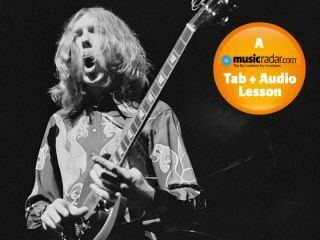 In the case of The Allmans it was the loss of lead guitarist Duane Allman who was killed in a motorcycle accident in 1971, and original bassist Berry Oakley in 1972, also killed in a motorcycle crash just a few blocks from the site of Allman's death. The original line-up of Allman and Berry along with Duane's brother Greg on vocals, guitarist Dickey Betts, and two drummers in Jaimoe Johanson and Butch Trucks released their self-titled debut album in 1969 to ecstatic reviews, but it only managed to sell 50,000 units when first released. The band began touring extensively, particularly around the southern United States and frequently extended their songs with jams of up to 40 minutes. Rather than being self-indulgent, these jams showed off the intensity and passion the band had for its music. After further moderate success with their second album, 1970's Idlewild South (which added more acoustic layers than its more raucous predecessor), the band scored their first gold certified album with the Live At Fillmore East double set. They were half-way through completing work on the Eat A Peach album when Allman was killed, but rather than replace him with another guitar player, the band moved further down the country flavoured road with Betts handling all guitar duties and piano player Chuck Leavell joining the group. Prior to this recording, Allman and Betts would both play some rhythm and some lead guitar - with Allman also being a wonderful slide guitarist. Betts' own slide work on the next album Brothers And Sisters was a revelation: it hit the number 1 spot in America for six weeks and featured the big hit single Ramblin' Man. Among many sessions that Duane played on, the most famous was Clapton's Layla And Other Assorted Love Songs. It's the earlier blues-rock rather than the post-Duane Allman country-tinged era that we're studying here. The track is a fairly typical I IV V type 12-bar, but the chords are a bit different than usual. The 'A' chord is an A7#9 chord - A C# E G C. It may have a tricky sounding name, but it's simply an A7 chord that has a raised 9th interval. You'll notice that it's a very Hendrix-y sounding chord. 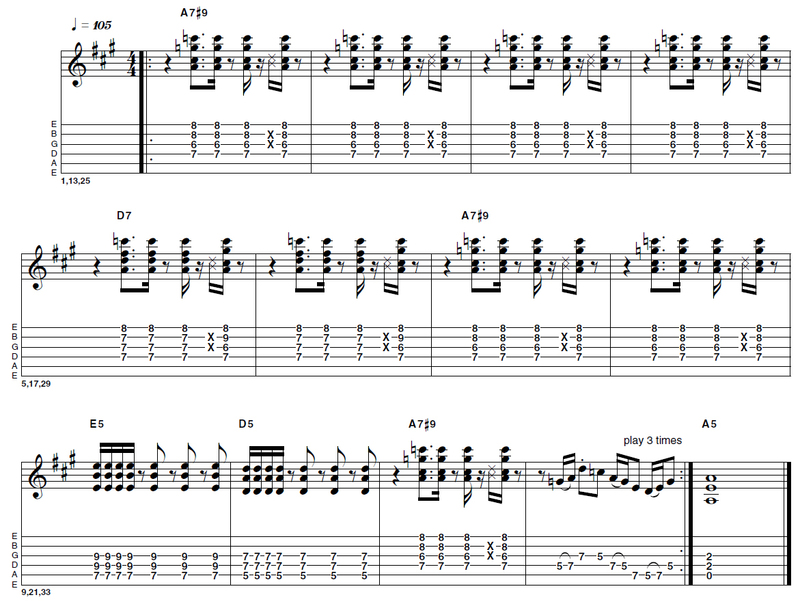 country edge to the bluesy solo when the major pentatonic is employed. 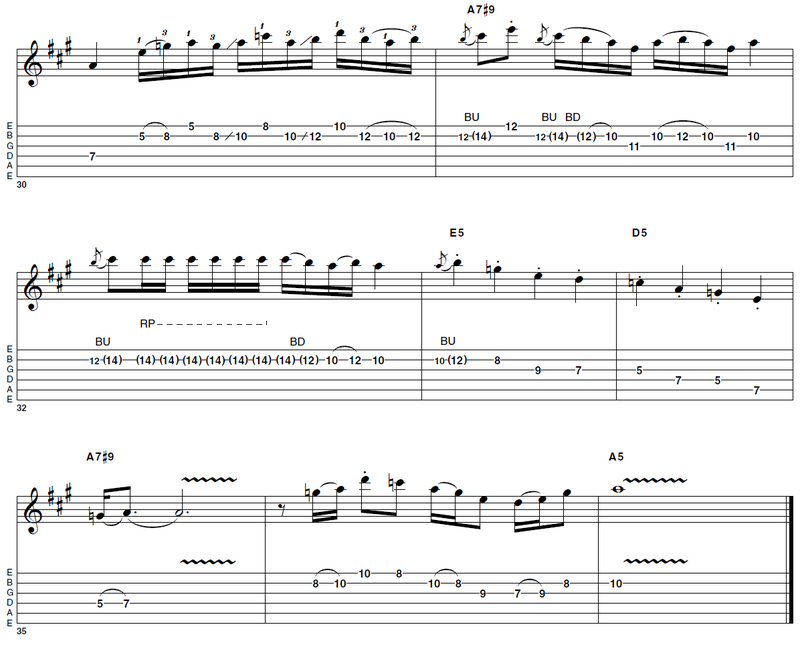 The solo has quite a lot of notes a la The Allman Brothers Band debut album, but obviously not in a 'shred' way! [Bars 1 & 5] Although a 7#9 chord is most readily associated with Hendrix, the voicing here is a little different to the E7#9 version we often see with the root note on the fifth string. Get the one shown here under your fingers and you've got a fresh option. [Bar 28] It's mainly 16th notes here, but they're not random. The phrase is leading towards the 'goal' (or 'money' note) that is the tone bend from G to A at the 8th fret on the second string at the start of bar 29. [Bars 30-31] This is where A minor meets A major pentatonic. Starting with a minor pentatonic phrase we work our way up to an A major lick hitting the C# with the tone bend at the 12th fret, second string (bar 31).